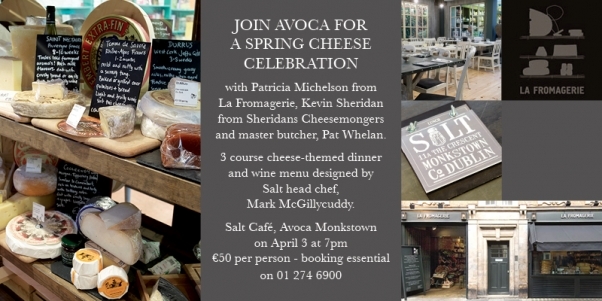 Join Avoca for an Irish Spring Cheese Celebration at Salt, Monkstown on April 3.
with Patricia Michelson from La Fromagerie, the highly regarded UK cheese shop, Kevin Sheridan from Sheridans Cheesemongers and master butcher, author and all-round food guru, Pat Whelan. There will be a big focus on local artisan cheeses and ingredients in the menu, with a section of Patricia’s new book, Cheese (what else!) dedicated to Irish Cheese. Enjoy a 3 course cheese-themed dinner and wine menu specially designed by Salt head chef, Mark McGillycuddy, with lots of chat about seasonal cooking, sourcing locally and of course, cheese. 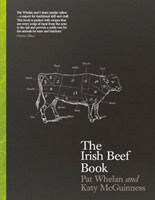 €50 per person – booking is essential, so please call us 01 274 6900 to reserve your place.